A meticulous and woefully long listing of the many issues that assail the Andaman Islands. Harish Kumar comes to the Andaman Islands to … well, it’s not clear what his purpose is. What he sees, who he meets and interacts with, what he notices… makes up the story and it is not the happiest of tales. This is a paradise — with its coral, exotic fish, turtles, dolphin, forests full of game, honey, timber and bamboo — on a slow inexorable slide into urban hell. Much of what Sekhsaria lays out is not new but is dismaying for all that. Given that the 2011 census pegged the population of the A&N Islands at 3,80,581, of which the Jarawas are a measly 300, it is clear who will win this battle. The indigenous people, once feared, now exploited, are up against a community who clear the forest, prepare the fields, construct houses and settle down. Add political machinations and business considerations to this mix and what you get is not a pretty picture. With civilisation, of course, comes the impending ruin of the indigenous peoples, with ‘Jarawa tourism’ taking hold, people giving the tribals packaged food, tobacco and pan masala and of course, taking photographs of the naked men and women with salacious intent. There are blatant violations of international waters by Burma’s Karen tribals, fishing for sea cucumbers and more serious plunder. There are unauthorised visits facilitated by the greasing of many official palms, of outsiders who come to gawp or document the Jarawa. Or worse, to sleep with Jarawa women. Outbreaks of measles among the Jarawas are hushed up by the authorities. Unscrupulous timber logging is depleting the natural forest cover. Mangroves are converted to paddy fields and plantations. A flourishing trade in croc skins ensues. Religious fairs are held inside Jarawa areas. And, of course, the Andaman Trunk Road that cuts into Jarawa territory; lifeline or yet another incursion? At times, the anthropologist in Sekhsaria overwhelms the novelist. The story is woven around environmental and anthropological concerns, so the many characters don’t hold the reader’s interest in more than a cursory fashion. The author wants us to know and absorb much information, so people sermonise or lecture for pages on end. 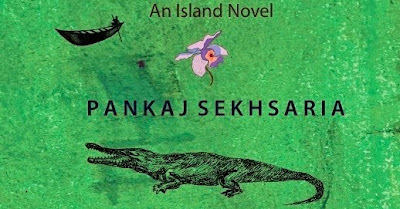 Ultimately, Sekhsaria cares about the islands, the vanished Ongles and Great Andamanese, the spirits of the forest, the Jarawas, the fast-changing character of the dense rainforest canopy, and that is what this book is about. I can’t help feeling, though, that it would have been a better piece of non-fiction. The passages that give us a potted history of the islands, tell us about the wave of humans encroaching on prime crocodile habitat, the Giant Leatherback turtles coming in to lay their eggs, the history of the Local Borns, how Aniket got its name, how the Jarawas collect honey without getting stung are so interesting, you really don’t want Harish and Seema — the two main characters — intruding.